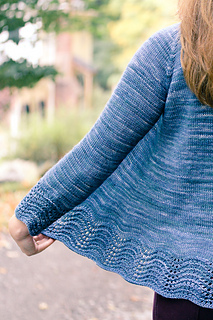 Originally published in Interweave’s knit.purl Spring/Summer 2015, Featherfall is now available for individual download as an indie release, with an expanded size range to 10 sizes and written with my usual layout, style and photography. 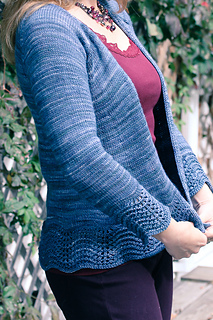 Classic stitches and an unusual construction combine to make Featherfall, an open front cardigan worked seamlessly from the top down with modified raglan construction. Featuring shaped waterfall fronts, an undulating feather and fan hem & cuffs, and an elegant applied I-cord finish, Featherfall is both refined and at the same time simple. 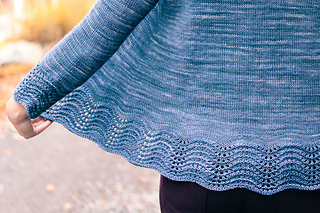 Featherfall is worked back and forth from the top down with modified raglan shaping. 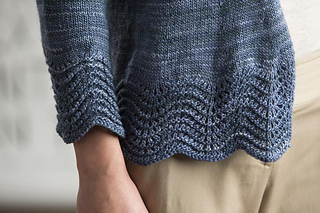 The back and sleeves are worked in the raglan style to the bottom of the armholes, then the body and sleeves are divided and stitches are picked up along the front raglan lines to create the fronts, which are united with the back. 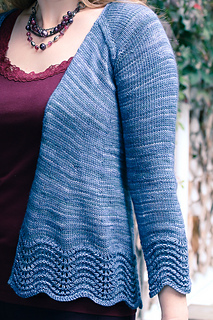 Sleeves are worked in the round from the top down. Drapey waterfall fronts extend from the front raglan shoulder seamlines as the natural angles are shaped further with additional body increases. The body is finished with a wide lace hem; three-quarter sleeves are worked seamlessly in the round to matching lace cuffs. 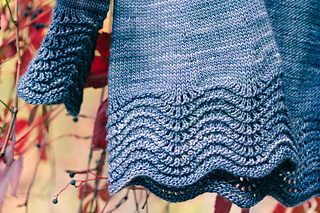 The front edges and neckline are finished simply with an elegant applied I-cord. Featherfall is meant to be worn open; the angled fronts will not meet at the bust, but will overlap at the hem if placed flat. The back is longer than the front, with an angled front hem that shows off the lace pattern. 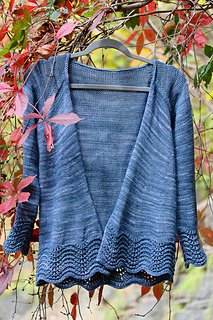 Techniques & Skills Used: raglan construction, knit/purl, increasing/decreasing, cable CO, backwards loop CO, applied I-cord (with linked video tutorial). 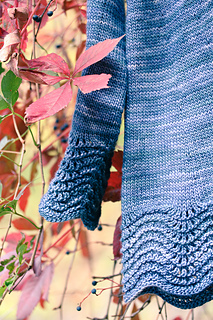 Lace stitch pattern is both written and charted. Size: 30 (32, 34, 36, 38, 40, 42, 44, 48, 52)”; based on twice the back measurement at underarm; shown in second size worn with 3” of negative ease. Yarn: Malabrigo Yarn Silky Merino (51% silk, 49% merino wool; 150 yards/137m/50g), shown in Cloudy Sky, 6 (7, 7, 8, 8, 9, 9, 10, 11, 12) skeins, or approximately 900 (950, 1025, 1100, 1175, 1250, 1325, 1400, 1575, 1675) yards of wool & silk blend DK weight yarn. Other Materials: US 5 (3.75mm) 32” circular needle or size to match gauge; US 5 (3.75mm) 60” circular needle for I-cord edging; Stitch markers (8); Stitch holders (2); Yarn needle. Gauge: 22 st and 30 rows/4” in stockinette stitch, after blocking. The single ply silky yarn grows significantly when blocked; be sure to wash your swatch as you would the finished garment to check gauge.